The motorcar involved in the accident. The driver of a silver 212 Toyota Carina motorcar bearing licence plates PKK 7006, has left millions in dollars in damage to two Regent Street Stores. He also caused a vagrant to be hospitalized, after he ran off the road and took to the Regent Street pavements. Witnesses who were in close proximity to where the accident occurred, claimed that there was a loud crash around 03:00 hrs, then screams could be heard. 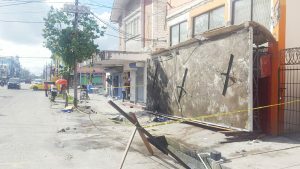 When persons ran to the scene to ascertain what happened, four vagrants were pinned under a shed that had been uprooted by the car that came to a rest some 150ft away. One of the individuals pinned had both of his legs crushed. The scene was one of blood; the emergency services were called and the injured were taken to the hospital. 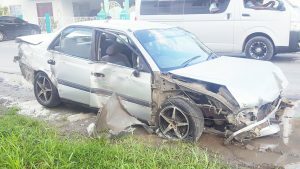 When the driver of the car emerged, witnesses claimed that he said he saw someone in the middle of the road and swerved to avoid hitting the person. He also said he was going at 60kph, which witnesses claim can’t be true, since the car came to rest 250ft away from the first point of impact, suggesting that much more speed was involved. The damages that occurred as a result of the accident. The owner of Household Plus has already pegged damage to his store in the millions of dollars, since three shutter doors and a complete shed were destroyed. The police have since taken possession of the motorcar and the driver in custody assisting with investigations.